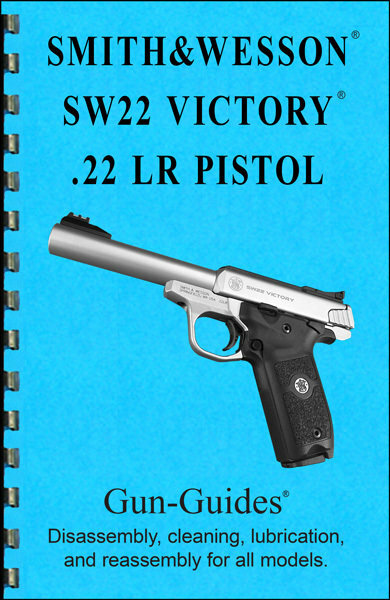 Smith&Wesson SW22 Victory® Pistol - Gun-Guides® Disassembly, cleaning, lubrication and reassembly for all models. • Includes a complete parts list and illustrated exploded view of ALL parts. • 26 pages & 54 high-resolution grayscale images. • ALL images and text are © 2017 Gun-Guides, LLC. - ALL Rights Reserved. All references to Smith & Wesson®, SW22®, and VICTORY® are trademarks of Smith & Wesson Corp. Gun-Guides® and this publication are not affiliated with or approved by Smith & Wesson Corp.